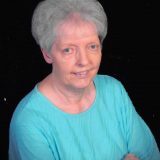 Darlene Morgan Weeks, age 79, crossed the River Jordan to her Heavenly Home with her Lord and Savior Jesus Christ on Tuesday, August 29, 2017. She was born in Haskell, Texas on April 1, 1938 to Fred Morgan and Ruby Lee Roberts Morgan. They preceded her in death. Services to honor her life are scheduled for visitation to be at West Oaks Funeral Home, Sulphur Springs, Texas from 6:00-8:00pm on Friday, September 1, 2017 with funeral services at Central Baptist Church, 840 Connally Street; Sulphur springs, Texas at 11:00am, on Saturday, September 2, 2017 with Pastor Bruce Stinson and her Grandson, Ryan Harrison officiating. Pallbearers will be Doyle Starrett, Bro. Don Tinsley, David White, Jeff Trollinger, and grandsons, Ryan Harrison and Clay Harrison. Honorary Pallbearers are The Crusaders Sunday School Class of Central Baptist Church of which she was a Charter member and her friends and co-workers at Alliance Bank. Interment will be at the Shooks Chapel Cemetery on Highway 154 South. Darlene graduated from Haskell High School, in Haskell, Texas. She enjoyed playing volleyball and was actively involved in other extracurricular activities. She loved to sing, especially singing special music at her Church in Haskell, Texas. She was invited to sing on television in Abilene, Texas where she moved after graduating from high school. She was attending court reporter school in Abilene when she met James “Jim” Weeks who was in the U.S. Air Force, and stationed at Dyess Air Force Base. Darlene and Jim were married by the Pastor of the First Baptist Church of Abilene on August 18, 1956. They were married 61 years and 11 days at her passing, having just celebrating their 61st Wedding Anniversary on Friday, August 18, 2017 while she was a patient in the local hospital. Darlene was a loving wife, mother, grandmother, and great grandmother. Her family, Jim’s family, and all her friends were precious to her. She loved her Lord and Savior, and enjoyed worshiping at Central Baptist Church where she had been a member over six decades. She was not able to attend Church for the past several months due to her declining health. She loved to read, collect tea pots, and musical boxes. She also delighted in shopping for new clothes and shoes. Jim like to kid her about all the clothes and shoes she bought, telling her she had more clothing and new shoes than most department stores. Darlene retired from Alliance Bank on December 31, 1998 after 27 years. She was the purchasing officer when she retired, and had held several positions during her tenure at the bank. She developed a very special and lasting friendship with many of her coworkers at the bank, and shared many happy days with them, especially with her “lunch bunch.” She will be greatly missed by her family and all that knew her because she was always a loving and caring person. Darlene and Jim were blessed to have three children, six grandchildren, and nine great-grandchildren. Survivors include her husband James Earl “Jim” Weeks, their three children, Sheri Darlene Harrison and husband, Dr. Juan Harrison, James Gregory “Greg” Weeks, Russell Earl “Rusty” Weeks and wife Renee’, all of Sulphur Springs, Grandchildren, Ryan Harrison and wife Rebekah of La Jolla, California, Clay Harrison and wife Tara of Sulphur Springs, Mellissa Weeks of Sulphur Springs, Kristina Dyer and husband Richard of Greenville, Texas, Samantha Weeks of Sulphur Springs, Amanda Bailey and husband Jason of Campbell, step sisters, Nancy and husband Toxie of Farmington, New Mexico, and Joy Gail Davis of LA Habra, California.